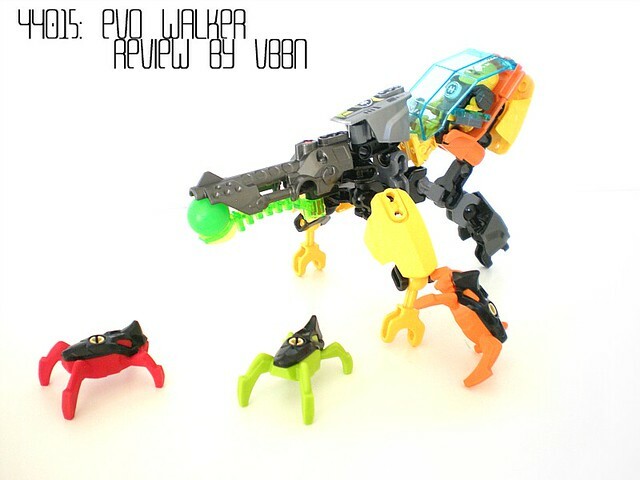 Hello everyone and welcome to my review of the set Evo Walker, one of the two smallest sets of the Invasion From Below line. Before I begin I'd like to give my thanks to the Lego Company and the Eurobricks staff who made it possible for me to bring these reviews to you. One thing that Lego has asked me to relay to you all is a note about the release dates for these sets. For those hoping to pick these up for Christmas, that may not be entirely possible; The sets will be released on January 1st for the majority of the world, and the United States will not see a release until March 1st. Moving on, let's focus on the set at hand. 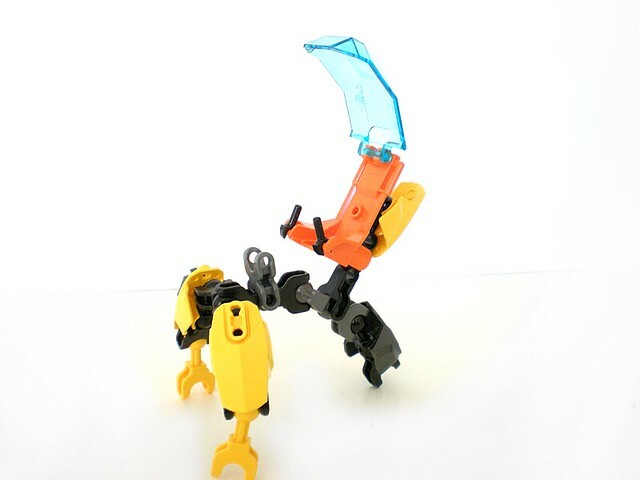 Evo Walker is one of the more overlooked sets of this wave. Evo himself is featured in three sets, one of which is the large Evo XL set. Is this set an underrated little gem, or is it an easy pass? Let's find out. Also, since this was sent from Denmark, this is the European packaging, hence the lack of a part count on the front. 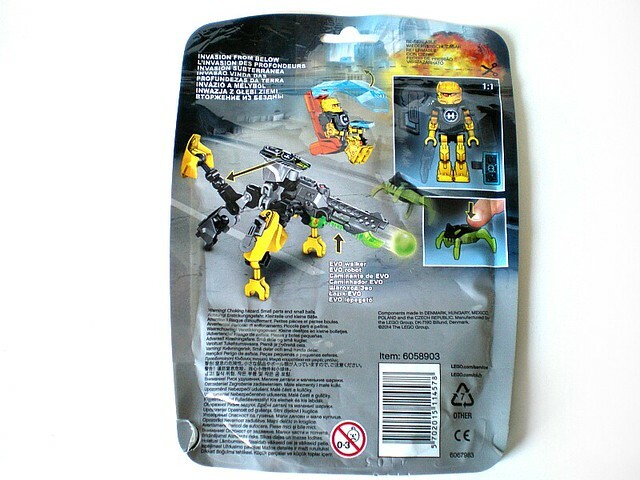 The back of the bag shows off some features of the set, including the jumping spider function similar to the mini Visorak of 2005, the launching sphere, and...a removable cockpit? I'm not entirely sure why they are advertising this as a feature, it's not necessary to remove it to place Evo inside of it. Also shown is a 1:1 scale of Evo with some of his accessories which we will take a look at later. There are a lot of different languages to be seen here, which I do believe is yet another result of being the European packaging. The bottom of the bags this year actually feature something special of their own; A nicely toned down version of the image from the top of the bag that I previously mentioned. It puts the image into a mostly black and gray silhouette, which really adds some life and professionalism to the packaging. Unfortunately, it's a bit difficult to see, and at the moment is proving impossible to photograph on the smaller sets. As you would hopefully expect, Evo Walker comes with an instruction booklet. The image on the front is no different than what we saw previously. The colorization of said instructions is spot on, not causing too much grief on the eyes to distinguish dark metallic gray and black. With a set with this low quantity of parts however, the issue wouldn't persist much even if it did. Yes, Evo comes with a sticker sheet. These are white prints with a clear backing, so I placed a black piece of cardboard behind the sheet here so you can make out the details of what you get. 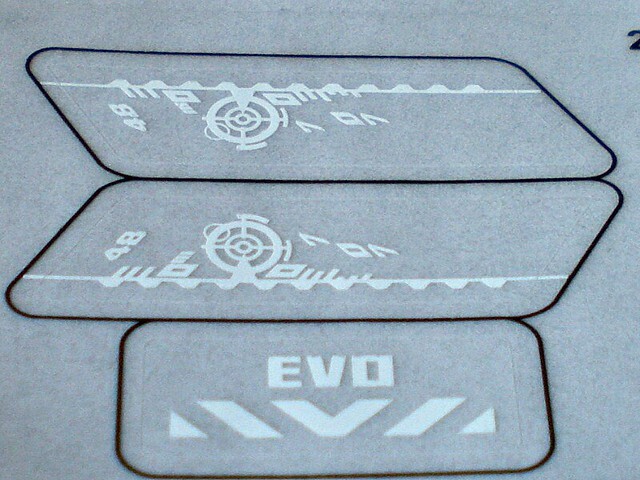 Being clear backed stickers, they are major fingerprint magnets and my "EVO" sticker looks a bit dirty on the canopy piece. I know a lot of people will be disappointed by this, but personally i don't mind it. 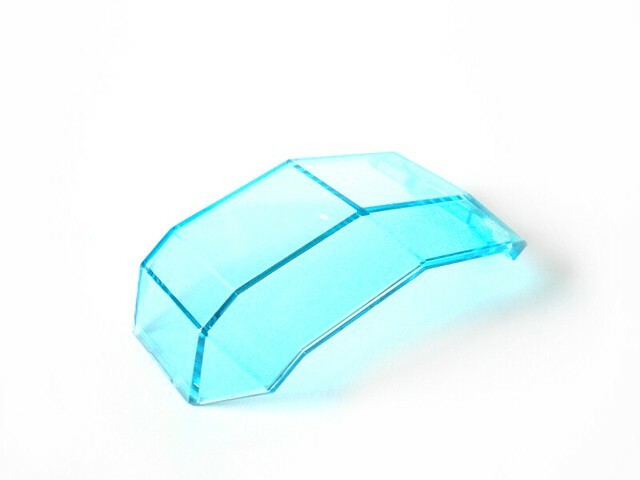 They are only used for the canopy, which does increase the versatility of the part. 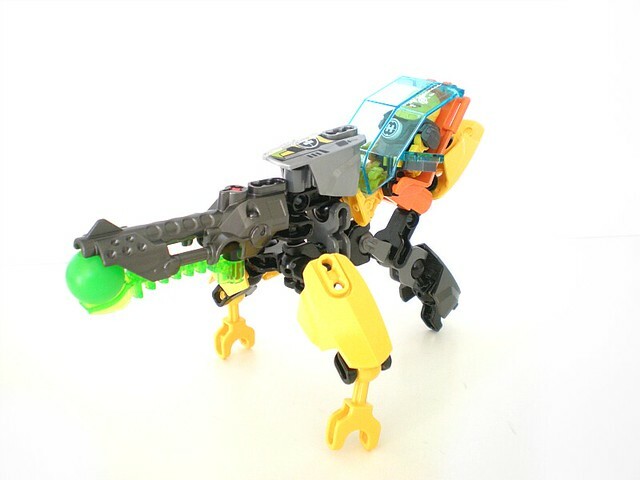 If you wanted to re-use this part in a MOC, it would be a little awkward to have the words "EVO" on it. The rest of the parts in the set are very lovely printed pieces. 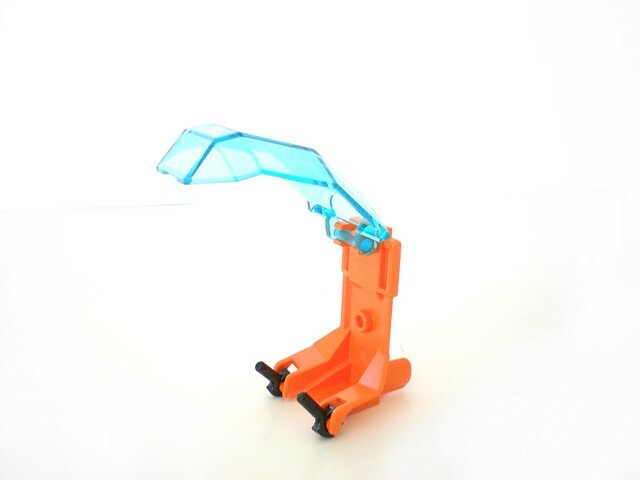 The canopy is designed to work with the chairs that are also included, featuring a 2-wide bar for attaching clips onto. The shape is nice, however as you will see it does not enclose the pilot well, even on sets like Furno where there are parts meant to act as covers for the sides. 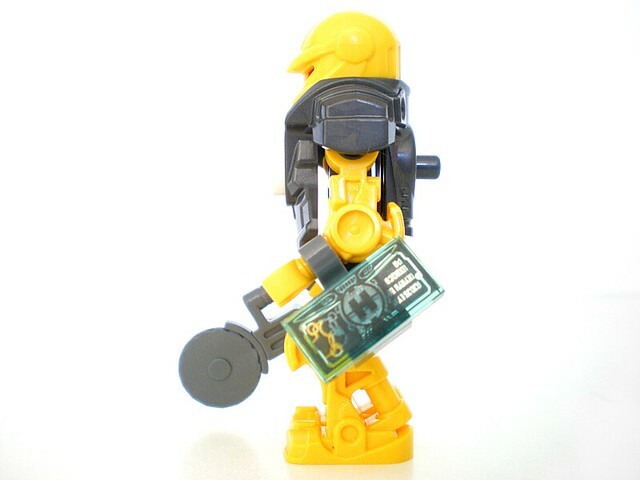 The bottom of the canopy sits right above the minifig's feet, resting on it's ankles, and some sets rely on an armor piece to cover or support their feet. In other cases such as Evo XL, the feet just dangle there. Any printed piece that doesn't have the Hero's name on it is a win for me. In this case we have an industrial looking plate with a bit of battle damage. Instead of receiving a new chest piece for the Heroes this year, we have gotten this, a large chair that clips on via a socket on the back. The chair itself is convincing, and has quite a fair amount of clip on points. 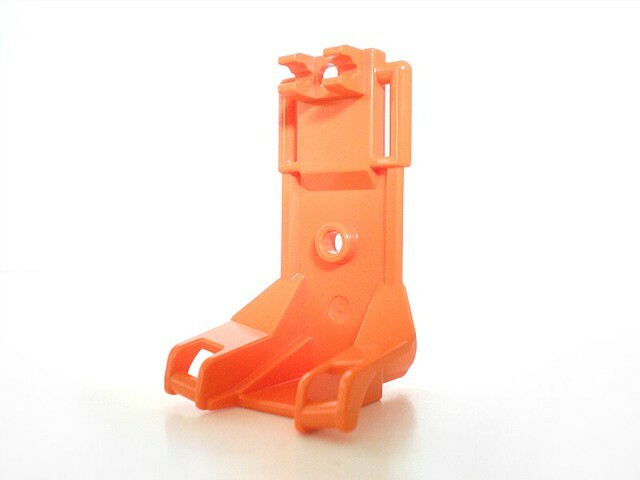 The handles at the base of the chair are for a set of Exo Force hands to clip onto and become controls. As you'll see later in the review, the angle of the clips is perfect with the angle of the figures hands, allowing the minifigures to properly grasp the controls. 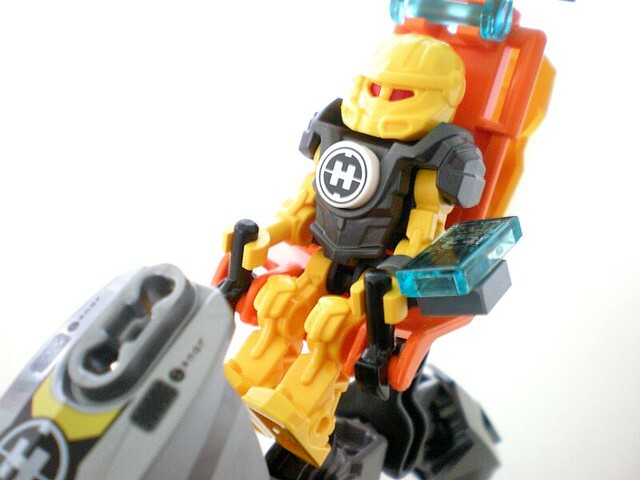 The hold at the center of the chair is where the minifigure connects to the chair, via the peg on their back armor. The build of the minifigure, while not difficult, is a refreshing change from the boring builds of the 2006/07 figures and the use of a skeleton torso brings them closer to being proper minifigs. 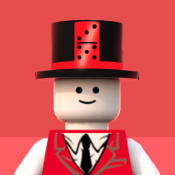 One thing you'll notice that will disappoint a few people is that the minifig head is solid red, not a trans red. While certainly a trans red head would be nice, it is highly impractical on this figure, as there are no hols in the helmet to allow light to pass through. By using a solid red, you can more clearly see his eyes without having to properly angle light. I shall let the pictures do a majority of the talking here. A couple notes you may wonder about; Firstly, he has clip connection points on his wrists (demonstrated by the datapad) and on the back of his ankles. The ones on his ankles are at an angle. Secondly, he has full front and back motion in the arms and legs, and his head can turn...slightly. The other heroes all seem to be more successful at turning their heads, in this case Evo's helmet is slightly too large at the base. The build is simple, however I'm pleased there is a build at all, as opposed to the single piece mini Visorak. 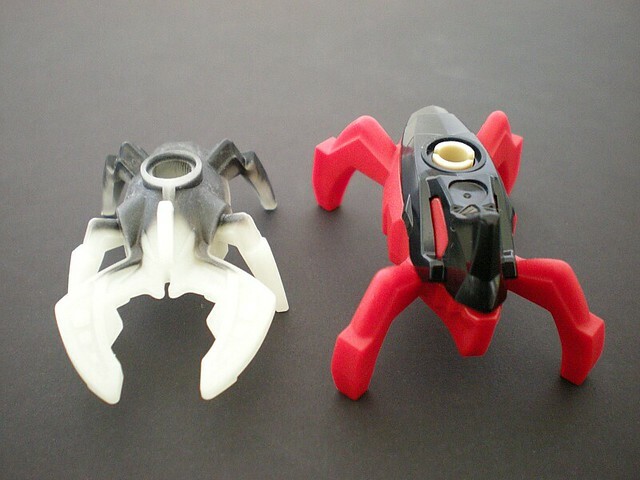 The small black shell is a hard plastic, and the legs section is a soft plastic similar to the Brain Attack brains. I'm a little annoyed at the usage of a tan 3/4 pin instead of a dark bluish gray as it would blend it in more, but that's nothing existing parts cannot fix. Ah, a comparison I've been eager to look at since we first saw the pictures of these guys. One really cool little feature is that, just like their Visorak predecessors, the miniature Kaiju can "leap" when you push down on their rears. The Visorak pulled it off a bit more fluently, but the miniature Kaiju have stronger legs which propel them really high into the air- And surprisingly, they have a high tendency to land on their feet! Taking a more in depth look at these two together, you can see something interesting, the legs are very similar in molding. They are slightly larger and more substantial, and the coloring is a bit more inspiring. The top of the seat has two clips that hold on to the canopy. 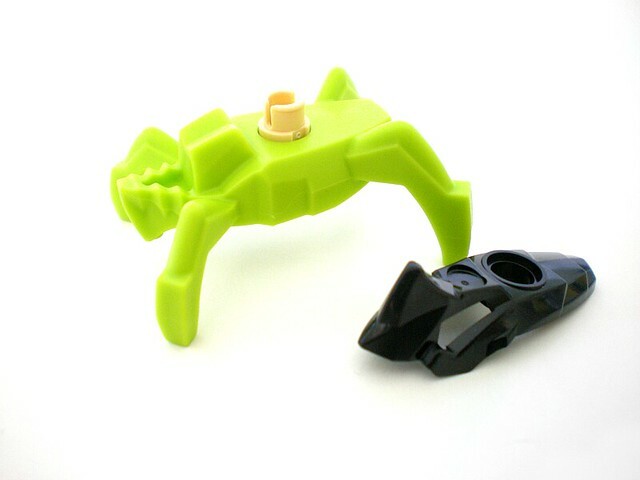 You can see the socket here which allows the seat to connect to the rest of the figure, and the EF hands placed on as controls. When attached to the rest of the Walker build so far, you can see one problem already starting to arise; The color scheme. 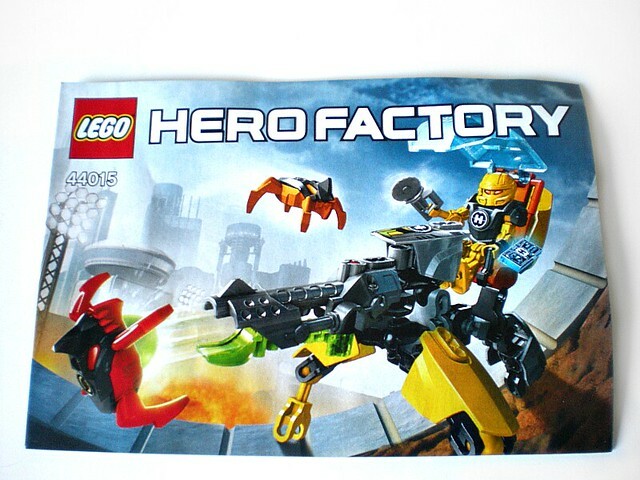 What is a wave of hero factory without a sphere shooter in some way or another? Thankfully they have kept the nice upper half, and I can never complain about having trans bright green launcher halves. And so here we have the finished build. It doesn't take long, and it's fairly obvious what you do next at each step, but the end result doesn't look too terrible. But let's get Evo inside there before we critique this set as a whole. When I look at this, I don't think "walker." 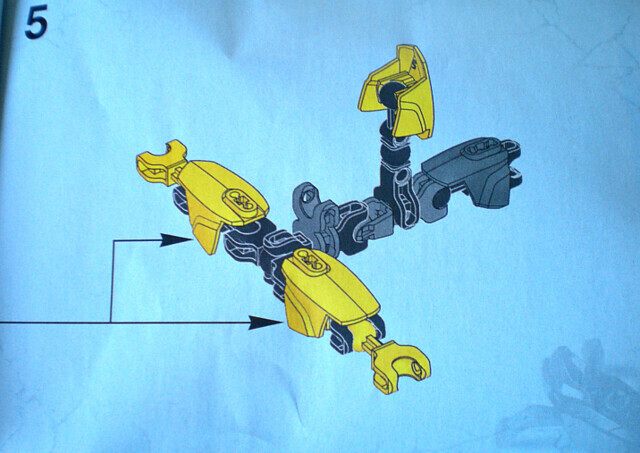 The legs can barely move due to the armor and the choice of bones they used, in order to properly move the front two you have to keep rotating the front double socket, and due to the cockpit's attachment point, the rear leg cannot be moved or else you start to move the entire cockpit back until he is staring at the sun. One other thing I have a big problem with here, that orange seat. Why? Was it really necessary to case it in orange?? I know a lot of fans don't like Evo being associated with trans bright green so much, but I would take that any day over this giant, random orange piece. The trans light blue canopy is also a bit needless, but due to the lack of colors available for this canopy, I'm okay with having this for future re-use. Due to it's construction, the turret itself is highly articulated, and can look tot he sides, down, and you can even bend it all the way to look back. 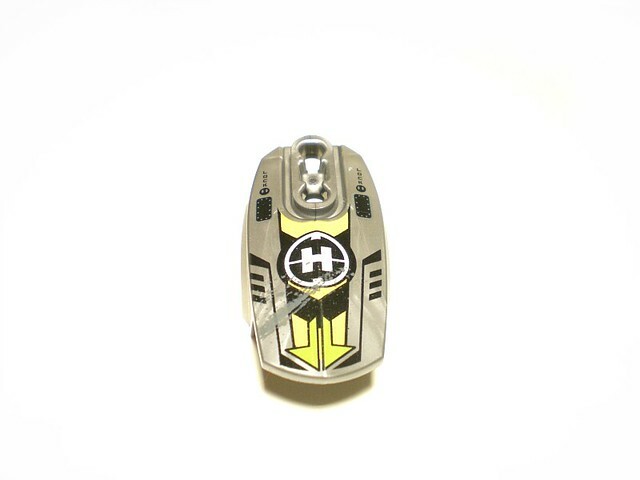 The only reason it cannot go up is because of the armor piece on top, which hits the canopy and restricts movement. As I mentioned earlier, the minifigures hands can fit perfectly onto the controls in these seats, which is a nice bonus. As a $10 set, Evo Walker is one you really have to have in hand to appreciate. While the color scheme is questionable and the overall small size of the set creating a thin structure, we have to see it for what it is. It's a very nontraditional build, breaking away from the bipedal and more animal-like or flying forms that we have gotten used to. It's a fresh take on the building system, and can be interpreted many ways. Sure, it's not really the first thing I think of when I hear the words "walker," but it could be seen as a city defense turret, or a deployable weapon that a drop ship can launch into battle. For $10, you get a minifigure and 3 of the miniature Kaiju, which is a great testing set for people curious about those components of this wave. Personally I plan on buying some more of these once the waves become publicly available, and removing the stickers from the canopies so I can have a series of city defense turrets. If you want a set specific to Evo, however, I would pass on this and jump for Evo XL instead. While costlier, the set itself is a far superior representation of a vehicle for Evo. Thank you very much for the review, I'm very much anticipating all of these sets. Reviews of all 8 sets will be released over the course of the day. I have some finishing touches I need to add to them however due to statistical report reasons I'll need to make sure they are all out by the end of the day. As always any questions or picture requests, do ask away. Thanks so much for doing these reviews VBBN, do take your time! 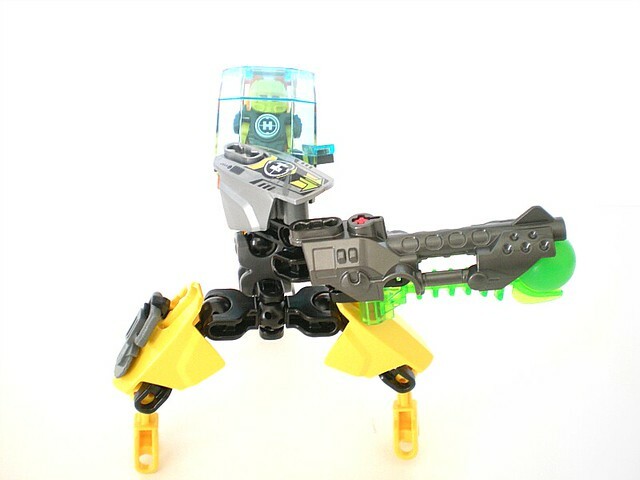 This set is a little disappointing though, it seems more like a turret than a walker to me. ...This set is certainly an oddity. On the one hand, I can't fault them for trying. It's clear there was effort here. A custom build, interesting concept... it's just a shame that the execution kinda fell flat. I can't help but feel this set would have benefited greatly had it been larger (not necessarily as intricate as Mazeka but somewhere along those lines), however as far as this goes... it's not terrible. 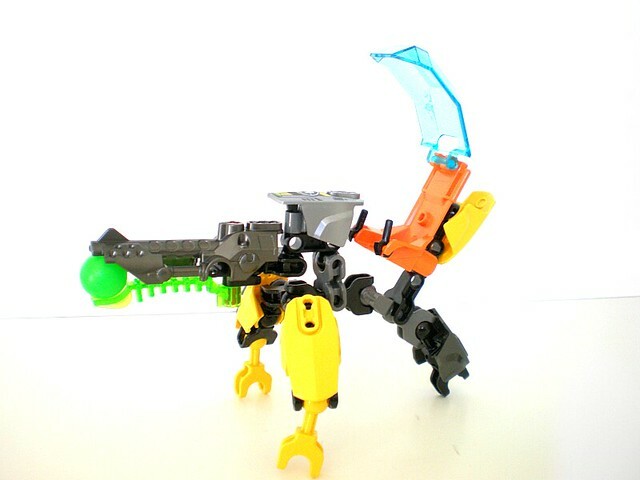 Seems like it'd be cool to have multiple and set up turrets alongside other minifigures to fight against the Beasts and whatnot. It's still probably my least favorite set of the wave due to the awkward color scheme and awkward posability. When the set list came out, this was the least interesting set to me. 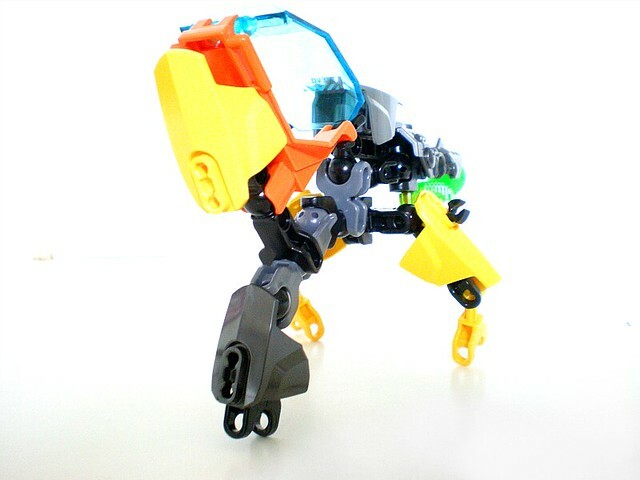 See, I'm not a fan of multi-legged mechs. When pics came out, this set was my least favourite. And this review changed..nothing. Nope, no interested in this set whatsoever. It's not even good as a parts back to me: I might get Evo XL M. if I find it at a good price but that's it. You get all the interesting pieces from Walker in larger quantities, except the small double C piece.. but you can find that elsewhere. I'm surprised at how tall the minifigs are, but I'm cool with it. 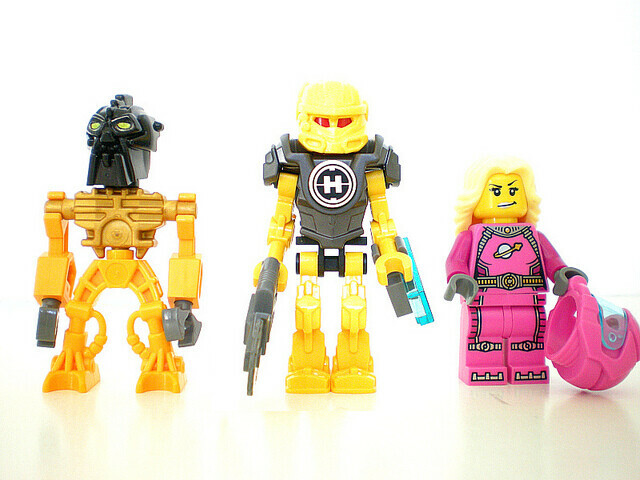 They can be still used in a minifig-scaled universe. I used to hate the solid heads but they DO make sense, making the eyes stand out very well. I just dislike Evo having red eyes- his eyes should always be a shade of blue IMO (the closest thing to lilac we have in terms of available head colours), but it seems Lego disagrees with me at every round. Finally, I don't mind the orange/lime cockpits, as they're generally well integrated into the colour schemes. This is the exception however- it should've been lime, like on Evo XL Machine. Wow. I love this new direction. Thanks for the review! I don't see why the seats aren't just metallic colors. 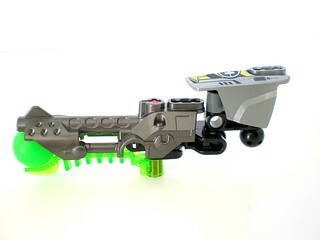 Despite some of these sets being metallic-heavy, those colors are more versatile as opposed to lime and orange. As for the set itself, not interested. I stick to what I said with this set being flimsy looking. That combined with a lack of pose-able legs, easy pass. But thanks for the review. I like this set as I can see the skeleton as a base build for some nifty Thornaxx-type critters, though. I do love all the articulation that launcher has. 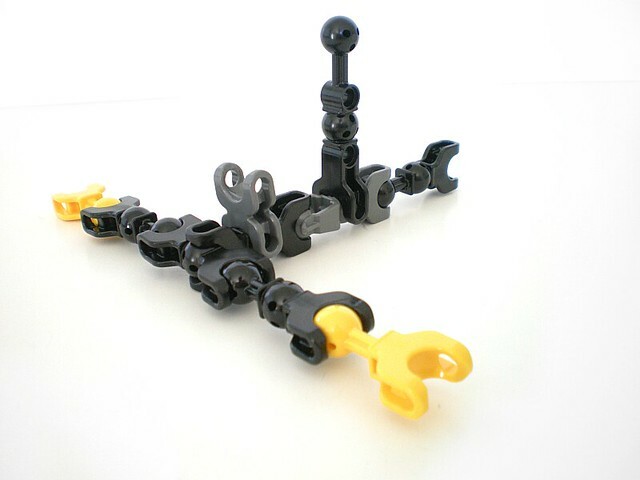 That said, I can't see where Lego made this and said "It's a walker!" Maybe if it had two more legs, I could see it crawling about, but as it is... I could see it more moving about as a hovercraft than walking. Additionally, I didn't think much of the color scheme until now that everyone has pointed it out. I'll probably pick it up, only for the mini Kaiju. Thanks for all reviews, It's sad that this set turned out like this, from the walker, I thought it would be a very wicked sturdy vehicle, but this set is very deisappointing, however the little kaiju's and Evo looks good. 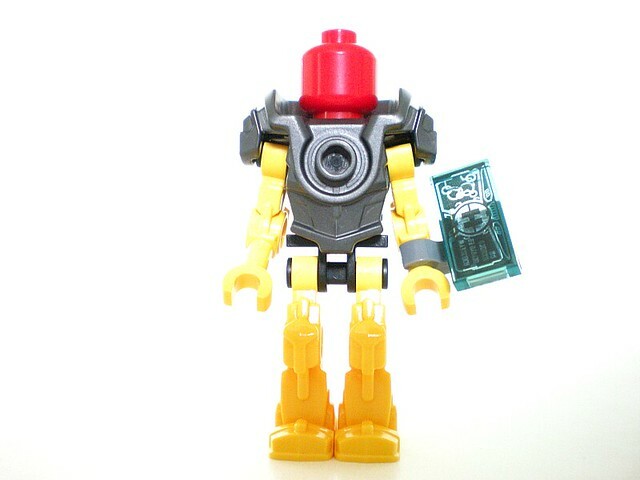 This might sound dumb, but what does that armor look like on a regular minifig? Surprisingly quite nice. It's a bit high on the shoulders, but it allows for the articulation when used on the Heroes so i don't mind it so much. I wonder if that gap could have been reduced somewhat if the heroes had used Ninjago skeleton torsos instead of the Castle variety. 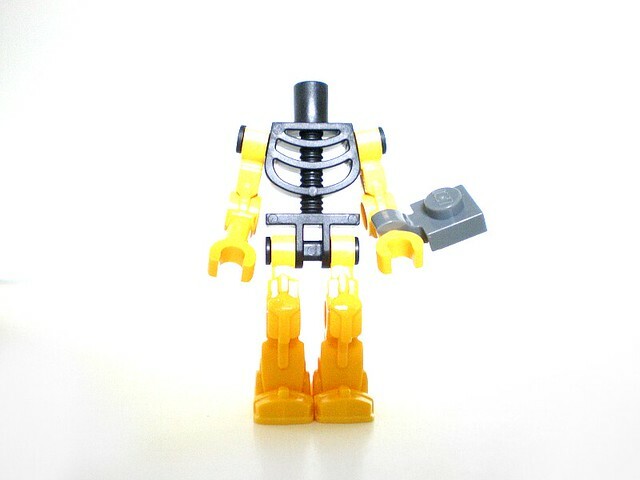 Ninjago skeleton torsos were designed with the shoulder joints somewhat lower and the torso itself somewhat thicker specifically so they would be compatible with the same torso armor as classic minifigures. 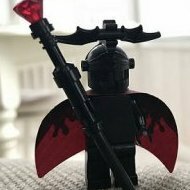 Truth be told, I was somewhat surprised when I first realized that the minifigures WEREN'T using the Ninjago skeleton torsos, though I think they end up looking alright with the older variety. 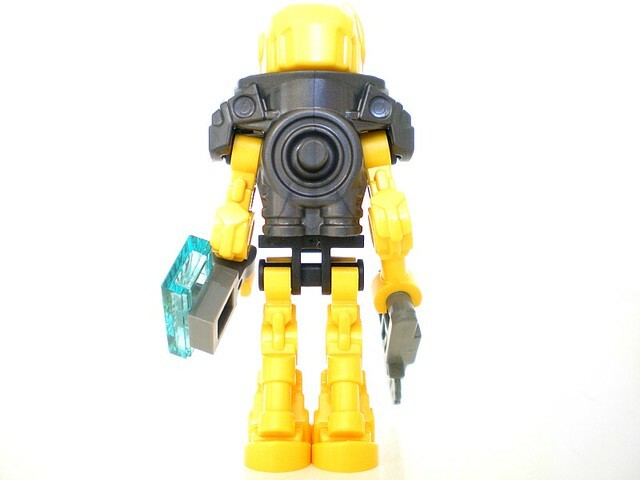 Oh, so the armor on the minifig is separate! Maybe I will get some after all. Gap aside, I'm surprised how much I like that. Maybe I'll pick some up. I'm not a hero factory builder, but I'm kind of kicking around the idea of using the Beast heads on some Alien mounts. On the armor... Is the gap because of the thickness of the neck part, or something else...? Skeleton bodies from LEGO Castle are slightly narrower than regular minifigure bodies, so minifigure armor doesn't fit them perfectly. The Ninjago skeleton bodies were designed to be slightly thicker to compensate, since all of them wore armor of some kind in at least one sets. 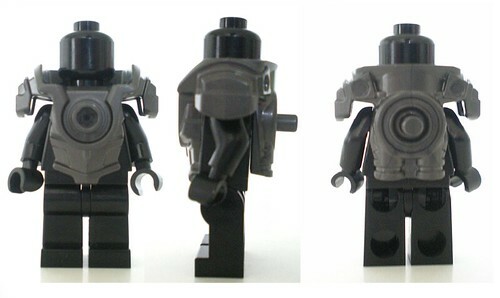 Normally a LEGO Castle skeleton wearing minifigure armor will have the armor able to wobble slightly due to the gap, but I think in this case the shoulders of the armor hug tight to the sides of the shoulder joints to prevent wobbling. 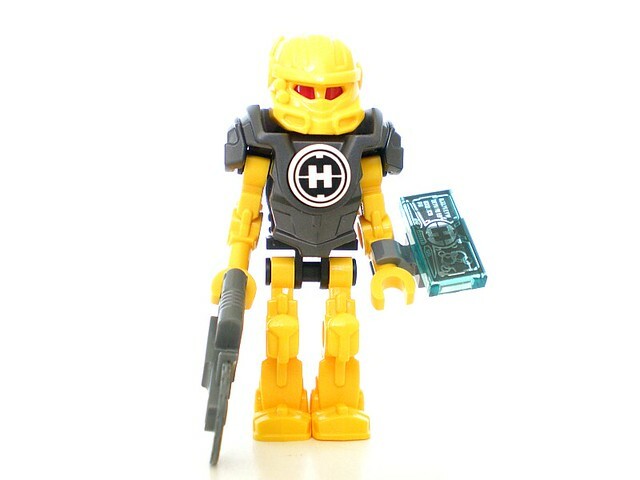 This will probably end up being my first HF set- good way to get an HF minifigures, and I'd like to play around with that canpy. Thanks for the review VBBN! I have mixed feelings about this set. On the good side of things, we have a set unique in it's appearance with a Hero, a Mech, and a plentiful amount of kaiju enemies. The bone structure is inspiring to me. It doesn't use a torso part, and still looks alright. It's still bulky, and from the packaging, looks kind of cool. That, and hello? 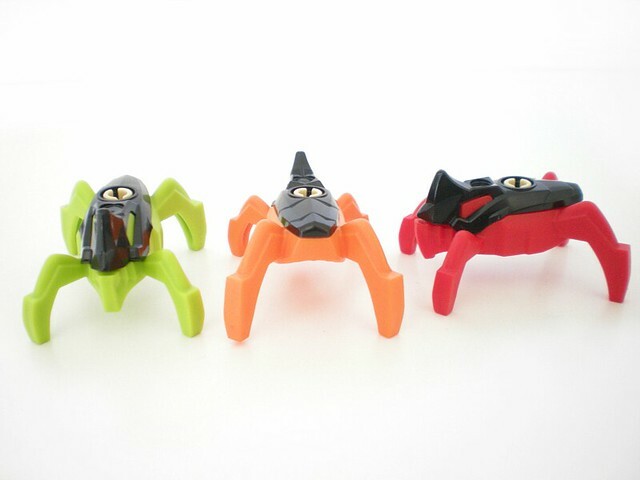 Three spider-kaiju! The downside of the set all comes down to the Mech. The colors clash. Orange, Green, and Blue all together, as well as the main yellow and grey. The open sockets on the floor look wrong somehow, like the figure was waiting to be finished and then deemed 'complete'. And the rear leg irks me a little. You can't bend it without moving the cockpit back away from the cannon. It's a nice idea, with a cool new MiniHero and THREE kaiju, but certain elements of the build let me down. However, it looks like it would be useful as a parts pack, and to bulking up your enemy army.. so it's not all bad. 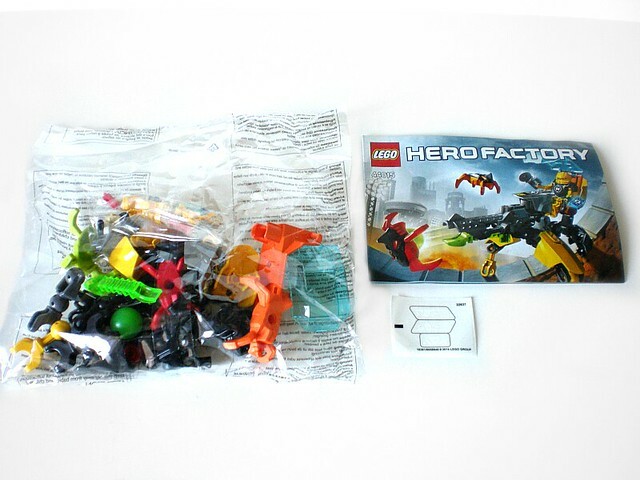 Is there any chance to see the Herofig setup using the Ninjago skeleton body? 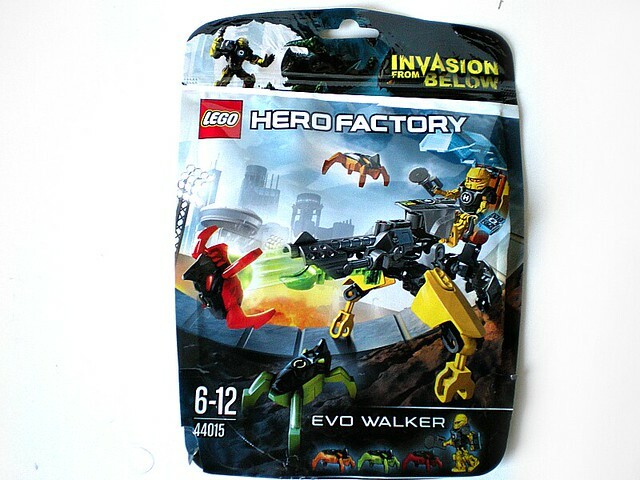 Although not the best of its kind, I really like that walker for deviating from the bipedal structures of most of the sets we've had from the Hero Factory line-up. Since I don't have enough to get the XL anyway, I'll be sure to get this, for the figure, the kaiju, and the novelty of the build. Amen to this. Ever since that was proposed I've been eager to see a picture with it used. i wonder, is it possible to build this guy using pices from evo XL machine only?